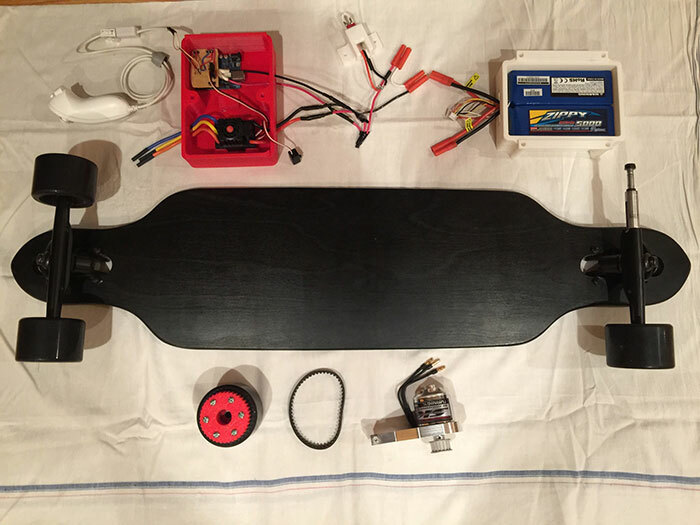 This tutorial is a comprehensive how-to on building your very own DIY electric skateboard. The electric skateboard I’ll show you how to make is a cool and fun method of transportation that is both easy to build and fun to ride! 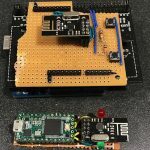 The skateboard is based on a few off-the shelf electronic and electrical components and is designed around the Arduino microcontroller, which means its functionality can be extended beyond the scope of this project. 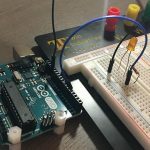 To learn some basics about the Arduino microcontroller before you start, check out this tutorial! 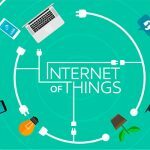 In this guide, I hope to show you how to build and program your very own DIY electric skateboard at a fairly low cost, and will discuss some ways I plan to extend and improve the skateboard’s features in future iterations. Deck: The long, usually wooden platform that the rider stands on. 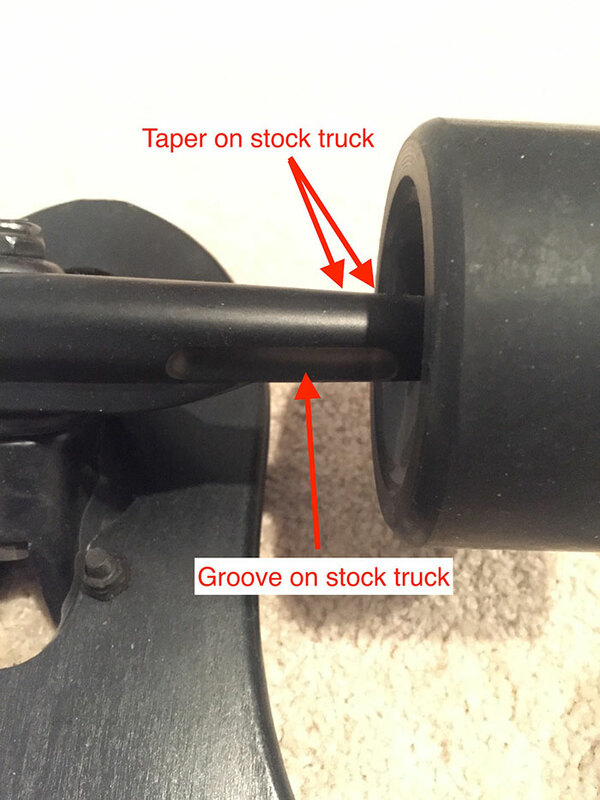 Truck: The T-shaped assembly mounted to the deck that serves as an axle for the skateboard’s wheels to mount to. There are two trucks on a skateboard. Reduction: The ratio of the motor’s speed to the speed at the drive assembly’s output stage. Reduction is usually expressed in “A:B” form, and is almost always a fraction greater than 1, meaning the motor spins at a higher speed than the output stage does. 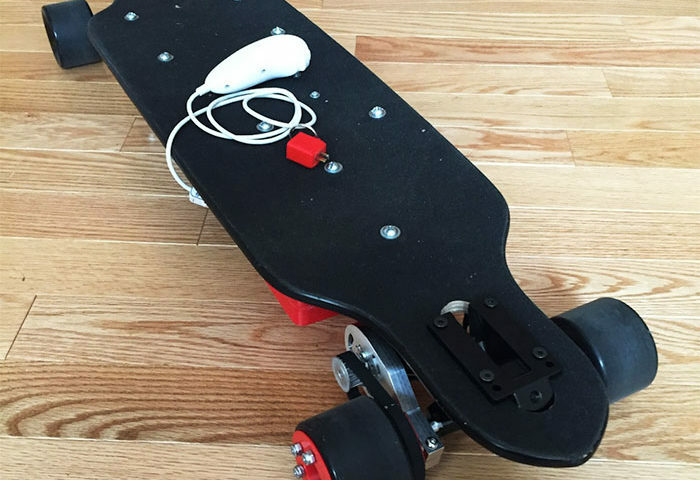 This DIY electric skateboard is powered by a single brushless DC motor connected via timing belt to one of its four wheels. The timing belt runs between two timing pulleys that form a 2.5:1 reduction. 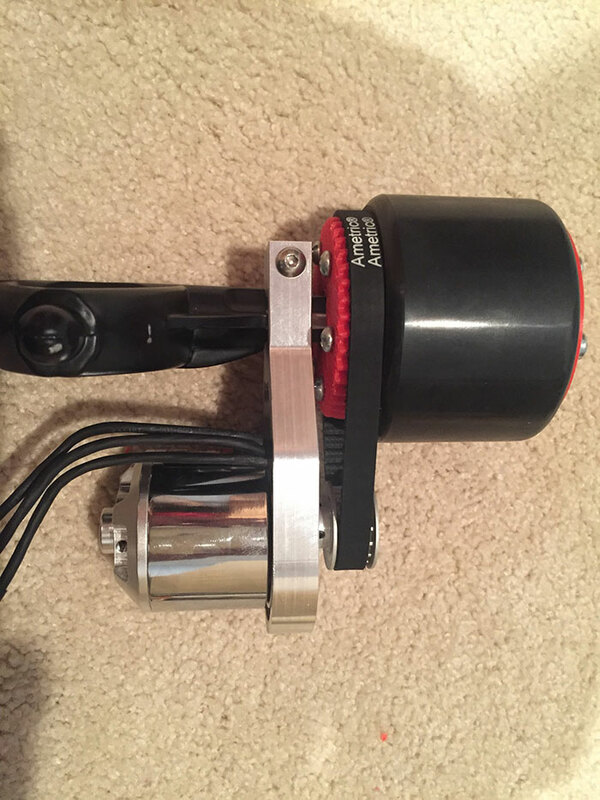 The 16-tooth aluminum pulley purchased from SDP-SI is the smaller of the pair and mounts to the motor’s shaft, while the 40-tooth pulley serves as the output stage of the pulley reduction and is custom-designed to fit into the recess of the skateboard wheel. A custom aluminum part that I designed in the CAD software holds the motor in place and keeps the timing belt in tension. Feel free to design your own timing-belt assembly to connect your motor to your skateboard’s wheel. You can find the CAD model of my drive assembly in the SourceForge repository here. 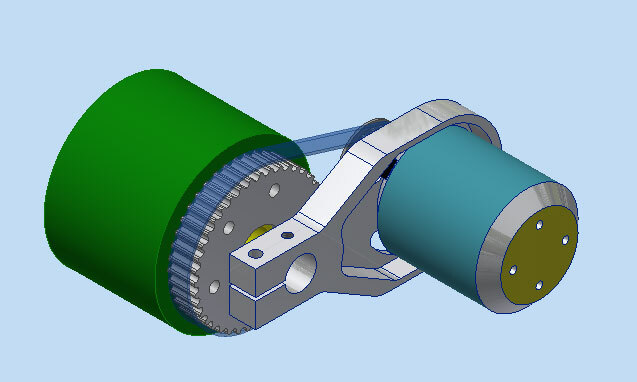 Figure 1: The CAD model of the skateboard’s drive assembly. The brushless motor, shown in teal on the right, is connected via timing belt to one of the skateboard’s wheels, shown in green on the left. 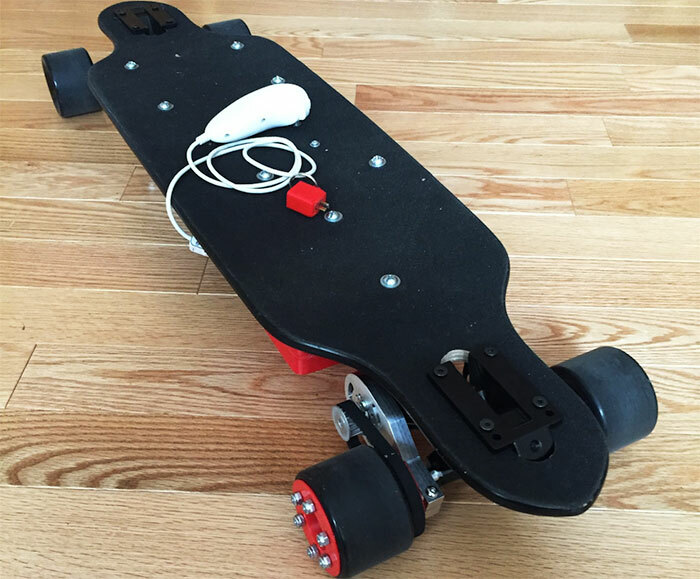 To create the custom part to mount the motor to the skateboard’s truck, I first downloaded and modified an online longboard model such as the one from GrabCAD to resemble the longboard I had with a fair amount of accuracy. To modify the model, I took measurements of the important dimensions of the board—the deck length and width, the height and width of the truck, and the size of the wheels—and compared them to the computer model, making changes where necessary. Note that it is not necessary to model your skateboard with 100% accuracy. I instead focused on the dimensions listed above to accurately represent clearances between the parts I added and the parts of the original skateboard. The completed model with my modifications turned out great! 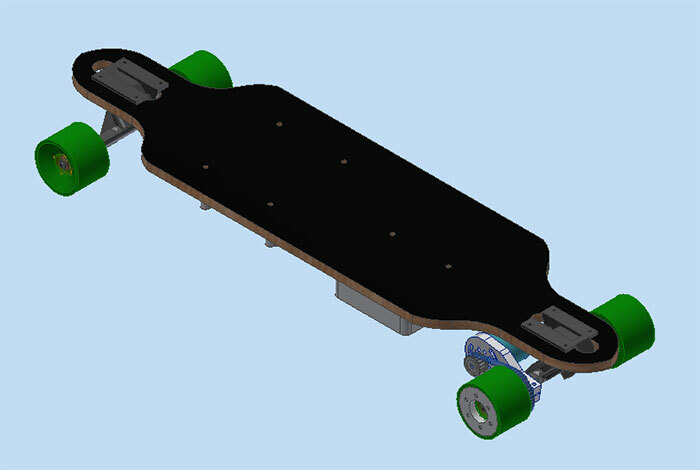 Figure 2: The completed CAD model of the skateboard. The drive assembly can be seen mounted to the shaft in the bottom right. I added a pattern of mounting holes for the motor on the part at different distances from the output stage to allow adjustment of the timing belt’s tension. Since the center-to-center distance from a timing belt calculator such as this one doesn’t always ensure that the timing belt is in perfect tension, having this adjustability on the part was a good safety measure and a good way to ensure that the belt on the final product was in ideal tension. Figure 3: The stock truck had two features, a groove and a long taper, that I removed to make attaching the motor mount-block easier. Figure 4: The motor mount-block is shown clamped to the machined truck. The taper and the groove on the stock truck were removed by turning down the truck shaft to a fixed diameter. This cylindrical section was machined out of the original truck on a lathe. To ensure that the 40-tooth output stage pulley mounted securely to the wheel that it would be driving, I modified a CAD model of a stock timing belt pulley. I added features such as clearance holes for screws to fasten the pulley to the wheel and a hub section on one face of the pulley that matched the recess of the wheel. 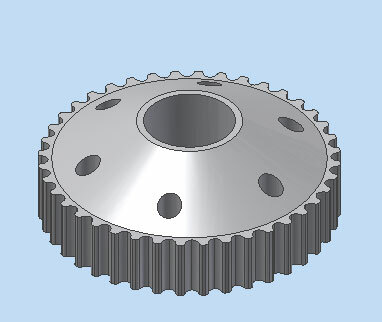 Figure 5: The CAD model of the custom 40-tooth pulley. The conical shape on top of the pulley allows it to fit snugly into the recess of the skateboard wheel. Screws were inserted through the six through-holes in the pulley’s face to secure the pulley to the wheel. 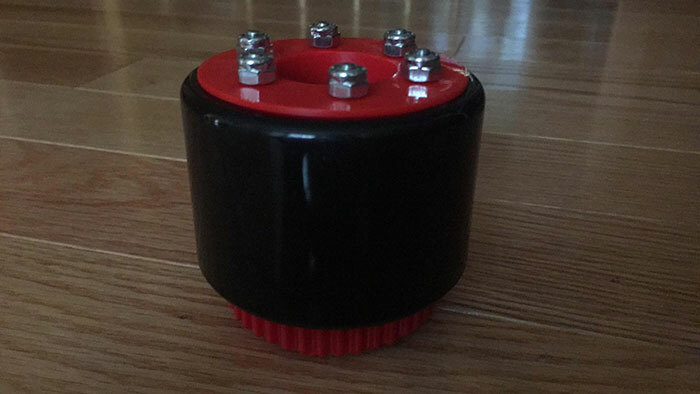 Figure 6: The printed pulley mounted to one of the skateboard wheels with screws. A custom 3D-printed plate (shown in the top of the picture) served as a large washer for the lock-nuts. I printed a small “plate” piece to fit on the side of the wheel opposite to the face of the pulley (the red part in the picture below the lock-nuts). The plate helps dissipate stress from fastening the two ends together and tightening the lock-nuts. It also provides a flat and solid backing to tighten the lock-nuts against, as opposed to tightening the lock-nuts against the soft rubber of the wheel. 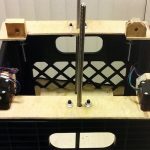 This custom pulley can be printed on a standard desktop 3D printer. To fasten the pulley to the skateboard wheel, I had to first modify the skateboard wheel to have through-holes in the same mounting pattern as the pulley. I used a mini-mill I had access to get this done! I also printed a small plate for the outside of the wheel (the model for which is included in this project) to serve as a backing for the lock-nuts attached to the screws holding the pulley and wheel together. The plate is the top red piece below the lock-nuts shown in Figure 6. Figure 7: The machined parts of the drive assembly connected together. 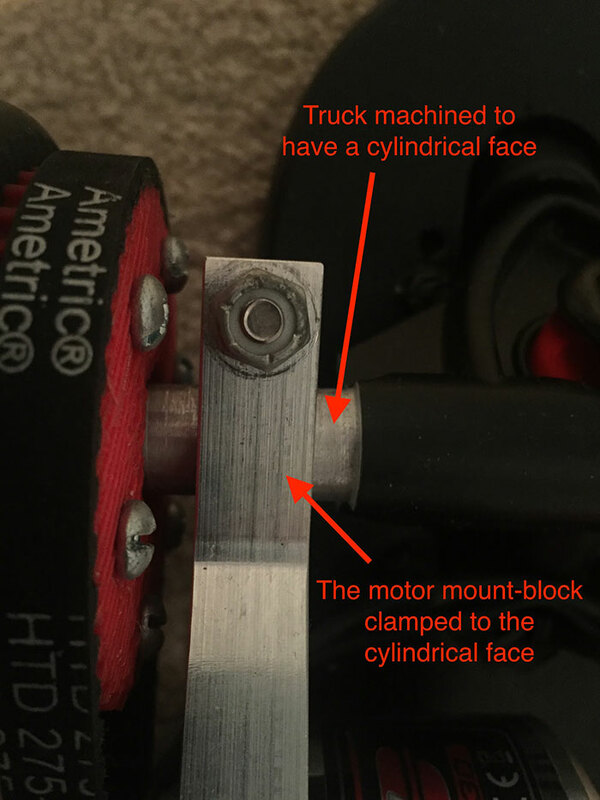 I designed my motor mount-block to have a perpendicular screw shown at the top of the mountblock in Figure 7, which clamps the mount-block to the skateboard truck when tightened. Finally, the last components I designed to be fitted on the skateboard were the custom enclosures for the control electronics and the batteries. You can find CAD models of my enclosures in the SourceForge repository here. I designed the enclosures to be printed with sufficient holes. The Arduino was fastened to the enclosure with small screws and the rest of the electronics with zip-ties. The battery case was carefully designed to fit the batteries snugly and securely while still allowing the batteries to be easily removed if necessary. Feel free to design your own enclosures to fit your board nicely. 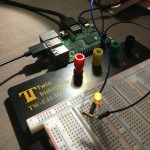 Instead of mounting the electronics underneath the skateboard deck as I did, you can also choose to put the electronics on top of the deck at the front or the back with some careful designing and wire-routing. The red enclosure (shown in the top left in Figure 8) holds the control electronics: the Arduino microcontroller, the Electronic Speed Controller (ESC), and the wireless Wii Nunchuk receiver. The white enclosure (shown in the top right in Figure 8) holds the two “3S” Lithium-Polymer (LiPo) Batteries.